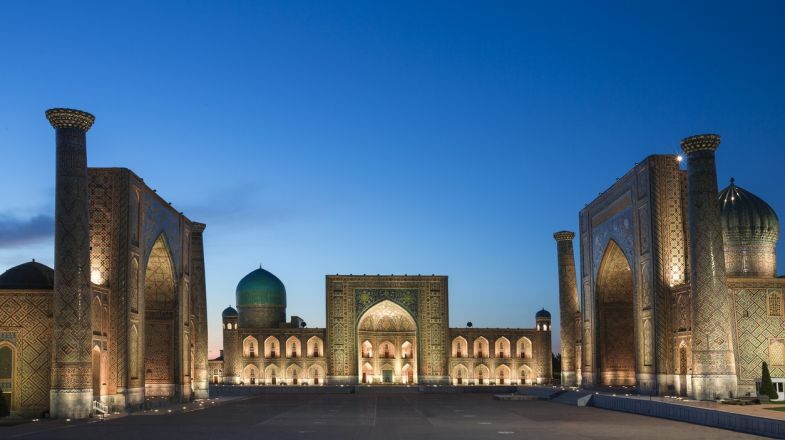 A trip to Uzbekistan will introduce you to the best treasures of the ancient trading Silk Road. The cities of Khiva, Bukhara and Samarkand were all popular sites for traders and have each been delicately restored.These stunning mosques and mosaics are complimented by classic Russian architecture, as the country equally pays homage to its many years under Soviet rule. With few foreign tourists, get ready for an intimate visit through Uzbekistan’s wonders. Uzbekistan offers some great transportation links for anyone wanting to see all the country has to offer. Whether you prefer domestic flights, high-speed trains, or city metro-rides, Uzbekistan has it all. While most of Uzbekistan's cuisine is quite flavourless (think boiled vegetables and grey meats), some dishes are worth seeking out. Try Lagman, a lamb soup with thick noodles and spices, and jiz, a stir-fry-like dish of beef, onion and eggplant. Avoid border areas in Uzbekistan, particularly at its shared borders with Afghanistan. These areas are often riddled with landmines and have been known to incur cross-border gunfire. Uzbekistan relies heavily on cash. Be sure to exchange your money before you visit, and carry the local currency (Uzbek Sum) rather than U.S. dollars or other foreign currencies. Uzbekistan is a police state, so be prepared for heavy police presence across the country. Carry copies of your passport and other ID with you at all times, and think twice before taking photos (especially of important buildings). The main benefit of this is a relatively low crime rate. Uzbekistan has seasonal weather so please do check up on best time to visit Uzbekistan before planning your tour.